The life of Bořek Šípek is a typical story about big world self-made men. He is often compared to a male Cinderella. At the age of fifteen, he became an orphan (both mother and father died of cancer). At nineteen, having nothing, he emigrated to Germany. Before emigrating he had graduated from an applied arts secondary school in Prague in the field of furniture construction. And he really made use of his studies. Before entering the university in Germany, he worked as a cabinetmaker. Thanks to the scholarship, he graduated from architecture in Hamburg and philosophy in Stuttgart. 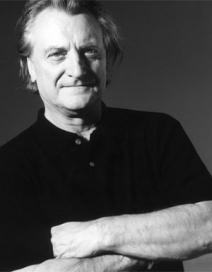 He taught design at universities in Hannover, Essen and then in Prague for many years. From 2005 he is the Dean of the Faculty of Architecture at the Technical University in Liberec, Czech Republic. Šípek’s first significant success was a glass house that he had built for his sister, for which he was awarded the German Architecture Prize in 1984. The world opened up for him and he moved to Amsterdam because he was attracted to the liberal atmosphere of this cosmopolitan city. In the middle of eighties he was contacted by the most prestigious Italian design company Driade. Cooperation with Driade was the beginning of the skyrocketing career of “the most distinguished contemporary designer” who “evokes the longing for magic in this horrid realistic world”. Driade published his new catalogue where Šípek’s work was on offer, which proved his importance to the company. At that time, only four people had their own catalogue – French Philippe Starck, Spanish Oscar Tusquets, Italian Antonia Astori, and Czech Boﬁek Šípek. Also thanks to the name Driade, people became more interested in his work and orders from other known and unknown firms soon came in. The Netherlands was struck by the Sipek-mania a Sipek started to aim at exclusive products produced in small quantities; he especially like to design chairs or other pieces of furniture, cutlery, glass, china, vases or lamps and other home accessories. And thanks to Driade, Šípek was also able to explore Asia and his own passion for Asian culture and eastern thinking in general.